"Pleasant Surprises that INVITE, INVOLVE and INSPIRE"
Our overall goal is to make the CSU a vibrant and attractive place of activity. We want to work with students to make that happen. The CSU provides Graphic Design services to meet the needs of the building with our primary clients being Student Activities and Student Events Team. The CSU Communications Coordinator and staff are dedicated to promoting events and activities within the CSU. The CSU Communications Coordinator Office is primarily responsible for overseeing promotional and posting within the building. Written request for exemptions would reviewed and authorized by the CSU Communications Coordinator. Events Scheduling operates separate from CSU Communications and is considered the “first stop” when planning an event. Still, by getting both offices involved early in your process, we can help avoid pitfalls and promote a successful event. By law, the following Required Statements must appear on all publications, with capitalization and punctuation as shown below and with department name and contact information inserted accordingly. The type size must be no less than 6 point. The type must be set in Futura or Arial, regular or bold only (no light versions). Use 100 percent solid color in high contrast to any background color present (for example, black on white or white on black); do not use screens or a percentage of a color. Avoid low contrast colors like black on purple or white on gold. This document is available in alternative format to individuals with disabilities by calling (Campus Organization or Department) at 507-389-XXXX (V), 800-627-3529 or 711 (MRS/TTY). Individuals with a disability who need a reasonable accommodation to participate in this event, please contact (Campus Organization or Department) at 507-389-XXXX (V), 800-627-3529 or 711 (MRS/TTY) at least ____ days prior to the event. This is your building. We don’t want to see it get damaged. Aesthetics. While we want this to be your living room, we also want it to be the front door to the University. SAF funded, Student Events Team, Greek Life and RSO activities will receive priority posting privileges. All others may be limited in number depending on space availability. Space availability will be monitored by the Centennial Student Union Office Manager (In CSU 220). 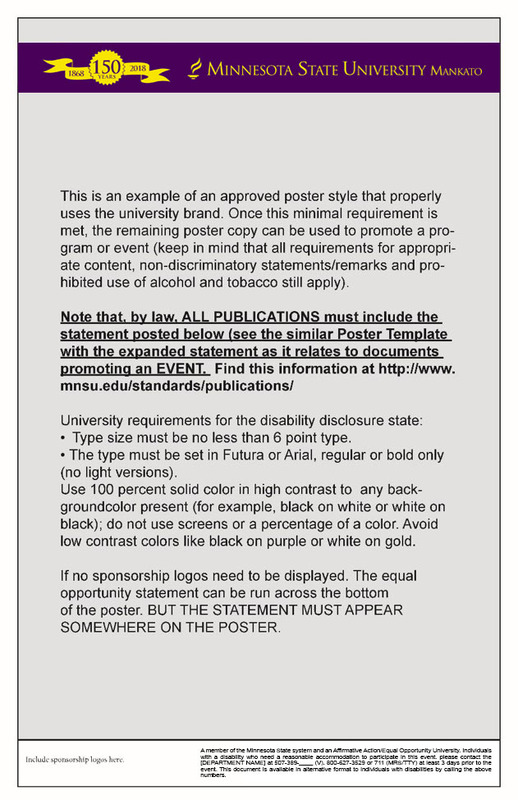 Posters and other printed publicity intended for placement within the Centennial Student Union MUST BE VALIDATED with a “Posted” Date Stamp administered in CSU 220. Postings can only be made on six designated bulletin boards within the CSU. ACTUAL POSTING OF PUBLICITY ON THE CSU BULLETIN BOARDS CAN ONLY BE DONE BY CSU STAFF DIRECTED BY THE CSU OFFICE MANAGER. Student Events Team and Student Organizations CANNOT post their own posters. A total of 62 Academic posting sites are available on campus. All posters must be have the “Student Union” or the “Academic Bldgs” stamp. Scheduling should include reserving time for decorating as well as post event cleanup. Again SCHEDULING IS ESSENTIAL. No decorations may be nailed, tacked or self-adhered to the walls, floors or any part of the building without the express permission of the CSU Director. When approved, BLUE MASKING TAPE is the only acceptable adhesive for attaching decorations to painted surfaces. No postings on wood and stone surfaces (this policy is relaxed during the two allowable special events promotions per year). Posting Charges will be levied against any organization for damages or insufficient clean up. (It costs CSU $48 an hour for a painter). NO SANDWICH BOARDS (A-FRAME displays) allowed in the CSU. Displays will be of a quality that includes printed posters or stamped/computer printed lettering. Display information must be in English or have an English translation. Banner spaces around the stairwell openings and other designated areas reserved through Scheduling. A special request to the Communications Coordinator must be made for banners hanging from the stairwell openings. These will be allowed on a limited basis. Are approved only for displaying educational content surrounding an event. Three display cases by Student Activities can be reserved through Scheduling on a first-come, first-served basis. Display cases may be reserved for a period of two weeks, with a limit of one case, per organization. Reservations can be extended for one additional two-week period if available. Flatscreens in the CSU offer digital signage for promoting Student Activities and events in the CSU. Items can be posted one week prior to the event. Ads or meeting notices are not allowed. EXTERIOR DIGITAL BOARDS "Barney Boards"
Chalk use prohibited unless a specific exception is made by Building Services. Use of chalk on sidewalks, walls, windows, etc. is prohibited. Flyers and/or handbills shall be approved prior to posting on approved bulletin boards. Flyers shall not be placed on light poles, walls, windows, vehicles, etc. The cost for removal of illegally placed items shall be billed to the organization or firm posting them. Table tents advertisement/promotion is NOT ALLOWED in the CSU. Placing flyers on tables, counters, etc. is NOT ALLOWED in the CSU. Special exemptions with proper notification include Student Senate elections and Homecoming activities. **Student Events Team will have two opportunities (including Homecoming) per school year when special exemptions are granted for increased promotional postings . POSTINGS ATTACHED TO NON-BULLETIN BOARD MATERIAL MUST BE MADE USING BLUE MASKING TAPE ONLY! Hours will be posted outside the Graphic Design Office. Any projects coming in after the two-week deadline, or projects seeking to “bumped” up the list will have to be submitted for approval to the CSU Communications Coordinator. The CAN is updated weekly and can be found at the bottom of the CSU homepage.